Summertime is the season to enjoy sweet, juicy melons. While all melons are a healthy choice, cantaloupe is the nutritional star, containing only fifty-four calories and all the vitamins C and A needed for a day in one cup of cubes. Melon is also an excellent dessert choice for people with diabetes, satisfying the sweet tooth with a small amount of carbohydrate. Cantaloupes are an ancient treat, with the first cultivated by the Egyptians and later the Greeks and Romans. Legend has it they entered the “New World” via Christopher Columbus on his second voyage in 1494. Today, the North American cantaloupe has a firm golden skin that looks like it’s wrapped in netting. Some varieties harvested in other parts of the world have smooth skin. Watermelon originated in Africa, and was introduced to the Americas through European colonists and slaves. Preparing a melon is simple. Just wash your hands and scrub the melon before cutting into it. Research has shown that bacteria may be pushed into the meat of the melon when cutting. Washing with a scrub brush under running water can reduce the risk of pathogen introduction. Research hasn’t shown that produce washes are effective in killing pathogens, but they are formulated to not leave a residue on produce, so aren’t harmful. Promptly refrigerate melon after cutting. After thoroughly scrubbing melon under running water, cut it into cubes. Place melon in blender with fresh mint and blend until smooth. Pour into appropriate sized plastic container with lid. Place in freezer. Take out of freezer 30 minutes prior to eating. Scoop into bowls for a refreshing, sorbet-like treat. Combine all of the ingredients in a blender and process until the mixture is smooth. 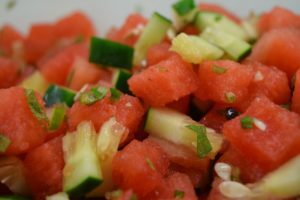 In a medium bowl, add watermelon, cucumber and mint. Mix well. Stir in lime juice and serve cold.